If you ask me, jogging is horrible, doing pool laps a little solitary, and walking so pleasurable it can’t really be counted as exercise. If only something existed that combined the benefits of all three, I might actually slip off the sofa and into a fitness regime. Alarmingly, on my last trip to Europe, I ran out of excuses. In the flower-filled Austrian meadows near Innsbruck, shoals of cheery, chatty people where speeding along practising the latest fitness crazes: Nordic walking. It looked enjoyable and sociable but – to judge from the puffing and perspiring – a reasonably good workout as well. So I was delighted to find out later that several river-cruise companies (including Uniworld and Avalon) carry Nordic walking sticks on board for passenger use. Nordic walking originated in Finland as a method to train cross-country skiers in summer. It’s best described as dynamic walking with the aid of poles, used not for support but for propelling you forwards (experienced Nordic walkers move almost as fast as a jogger). You also get an upper-body workout on the chest, shoulder and abdominal muscles. Nordic walking burns up to 20 percent more calories than ordinary walking, significantly raises the heart rate and reduces muscle tension in the neck and shoulders. And because some of the walker’s weight is on the poles, there is less pressure on the back and lower joints, especially the knees. 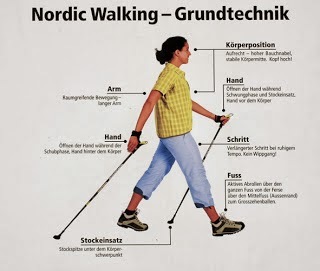 the best techniques for Nordic walking. It might soon be all the rage: this is the world’s fastest-growing recreational activity. 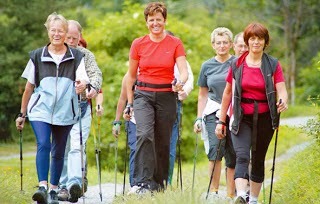 After all, Nordic walking is pleasant, an ideal group activity, and a more efficient exercise than mere walking. It’s easy to learn and easy to practice; the proper technique can be acquired after just a few lessons, even for the terminally uncoordinated such as myself. It’s great value too: all you need is poles and decent runners. Nordic poles have a metal tip for use on grass, sand or snow. Even here, couch potatoes will be hard-pressed to find excuses: if you have none of the above, poles are fitted with rubber pads for hard surfaces such as footpaths. I’m not a Nordic walking fanatic, but find it hugely enjoyable. On a river cruise, it’s the ideal counterbalance to all those delicious buffet lunches. It has certainly improved my physical fitness and – am I imagining things? – made me more cheerful as well. Maybe it’s because it’s an outdoor exercise. Birds cheep, the sun shines, my poles click along, and all’s well with the world. If this is vigorous exercise, how can it be so nice? Have you ever tried Nordic walking? You may want to give readers an insight into your own experience and whether you think it's worth a go. Add your comments below and join the conversation.